ISWAN's SeafarerHelp provides a free, confidential helpline service to seafarers and their families all over the world. With a multilingual team and 24-hour assistance year-round, the service helped nearly 10,000 seafarers of 86 different nationalities last year. 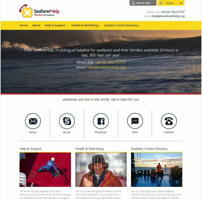 ISWAN has just launched a new website for SeafarerHelp that is designed to reach even more seafarers. The new website, which can be viewed in nine different languages, provides a number of ways for seafarers and their families to get in touch, including by telephone, e-mail, Skype, text message and a Live Chat feature. Trends last year showed that seafarers preferred to contact the helpline by mobile devices over the internet, so the website is optimised for mobile use. Seafarers can also access general information about common issues raised to the SeafarerHelp team via the website, along with downloadable resources providing guidance on health and wellbeing. The website includes ISWAN's Seafarer Centre Directory which helps seafarers find their nearest facilities in port.